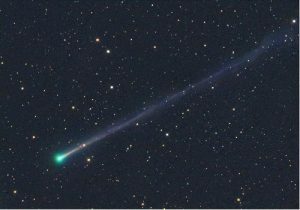 With the exception of US10 Catalina at the beginning of the year, 2016 was a bit of a damp squid for bright comets when compared to recent years. So what comets are in store for 2017? Are there any more naked eye comets on the horizon? Well, there are a few short period comets in 2017 that reach within binocular viewing brightness. One of which should reach just within naked eye visibility. There is also a hyperbolic comet but not reaching any significant brightness to write home about. Gracing our skies every 3.3 years, this regular visitor was the first periodic comet discovered after Halley’s Comet. With a nucleus of 4.8km, the comet reached perihelion on 10 March, 2017 and reached a fairly respectable brightness of magnitude 7. Positioned in Pisces throughout February for northern observers, the comet quickly brightened making it visible in binoculars by mid month. The comet then moved rapidly in to Aquarius and in to northern dusk by early March. Read more..